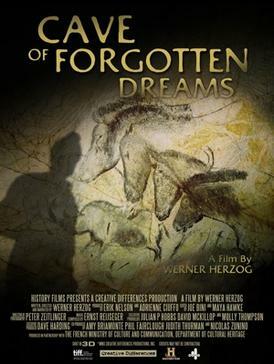 Cave of Forgotten Dreams is a documentary film about the Chauvet Cave. The film is directed by Werner Herzog, and is his first 3D film. The film consists of footage filmed inside the cave, as well as interviews with scientists and historians. The film also includes footage of the nearby Pont d'Arc natural bridge. The Chauvet Cave is a cave in the Ardèche department of southern France. The cave was first explored on December 18, 1994 by a group of three speleologists: Eliette Brunel-Deschamps, Christian Hillaire, and Jean-Marie Chauvet, after whom it was named. The cave contains the earliest known cave paintings, as well as other evidence of Upper Paleolithic life. Grotte Chauvet (Ardèche). Survey. By Y. Le Guillou, F. Maksud after Clottes, 2001. The cave is carefully preserved and the general public is not allowed to enter. Herzog received special permission from the French minister of culture to film inside the cave. Having received permission, Herzog nonetheless had heavy restrictions while filming inside the cave. All people authorized to enter must wear special suits and shoes which have had no contact with the exterior. Because of near-toxic levels of radon and carbon dioxide, nobody can stay in the cave for more than a few hours at a time. They also were allowed only to walk on a 2-foot wide pathway. Despite all the heavy restrictions, Werner and his team managed to brilliantly capture the atmosphere of the cave and the prehistoric evidence that surrounds it and they bring us an amazing 3D-documentary. You can see the trailer below. The movie will be released in the UK on 25 March 2011. Valerie Feruglio, De la faune au bestiaire - La grotte Chauvet-Pont-d'Arc, aux origines de l'art parietal paleolithique, Comptes Rendus Palevol, Volume 5, Issues 1-2, CLIMATS-CULTURES-SOCIETES aux temps prehistoriques, de l'apparition des Hominides jusqu'au Neolothique, January-February 2006, Pages 213-222, ISSN 1631-0683, DOI: 10.1016/j.crpv.2005.09.003. Dominique Genty, Bassam Ghaleb, Valerie Plagnes, Christiane Causse, Helene Valladas, Dominique Blamart, Marc Massault, Jean-Michel Geneste, Jean Clottes, Datations U/Th (TIMS) et 14C (AMS) des stalagmites de la grotte Chauvet (Ardeche, France) : interet pour la chronologie des evenements naturels et anthropiques de la grotte, Comptes Rendus Palevol, Volume 3, Issue 8, December 2004, Pages 629-642, ISSN 1631-0683, DOI: 10.1016/j.crpv.2004.06.005. Paul Pettitt, Art and the Middle-to-Upper Paleolithic transition in Europe: Comments on the archaeological arguments for an early Upper Paleolithic antiquity of the Grotte Chauvet art, Journal of Human Evolution, Volume 55, Issue 5, Chronology of the Middle-Upper Paleolithic Transition in Eurasia, November 2008, Pages 908-917, ISSN 0047-2484, DOI: 10.1016/j.jhevol.2008.04.003. Herve Bocherens, Dorothee G. Drucker, Daniel Billiou, Jean-Michel Geneste, Johannes van der Plicht, Bears and humans in Chauvet Cave (Vallon-Pont-d'Arc, Ardeche, France): Insights from stable isotopes and radiocarbon dating of bone collagen, Journal of Human Evolution, Volume 50, Issue 3, March 2006, Pages 370-376, ISSN 0047-2484, DOI: 10.1016/j.jhevol.2005.12.002. Jean Vouve, Florence Vouve, Jacques Brunet, Philippe Malaurent, Apport de l'analyse colorimetrique a propos de la caracterisation in situ des peintures prehistoriques dans une demarche conservatoire : cas de la grotte Chauvet (Ardeche, France) Contribution of in situ colorimetric determination for the characterisation of the prehistorical paintings before the elaboration of a conservation process: the case of the Chauvet cave (Ardeche, France)., Comptes Rendus de l'Academie des Sciences - Series IIA - Earth and Planetary Science, Volume 331, Issue 9, 15 November 2000, Pages 627-632, ISSN 1251-8050, DOI: 10.1016/S1251-8050(00)01459-2.